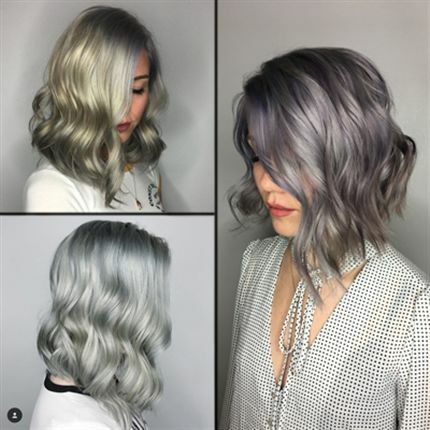 Creating cool-toned, metallic melts on typically resistant, Level 1 Asian hair can be SUPER hard—but not for Linh Phan, aka @bescene to his 276k followers. He’s a master at prelightening and laying down some of the most gorgeous metallic tones you’ve seen on your Instagram. We’ve got the info on some of his top color formulas—and you can see him LIVE at THE BTC SHOW Aug. 26-28 in San Antonio! Linh has two must-haves for coloring: Schwarzkopf Professional BLONDME Premium Lift 9+ and b3 Brazilian Bond Builder. He’s also upfront with clients that time and patience are crucial to the process! Check out this evolution of Asian hair going silver, then get six of Linh’s coolest formulas!